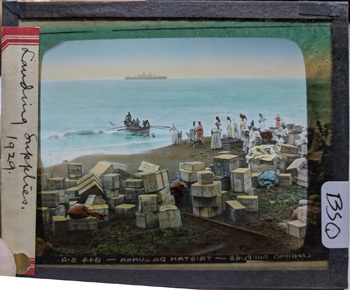 66 rare colourised magic lantern slides of Tristan taken by missionaries in the 1920s are for sale on eBay. 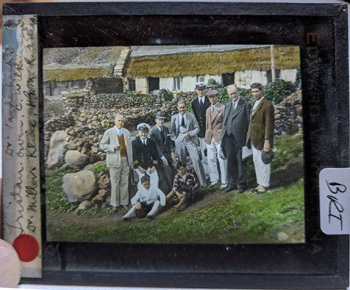 A set of 66 rare colourised magic lantern slides of Tristan da Cunha have come up for sale on eBay. They are being sold individually, and some have already gone, but the vendor would be willing to consider offers for the remaining set. Sample images are reproduced here by permission of the vendor. 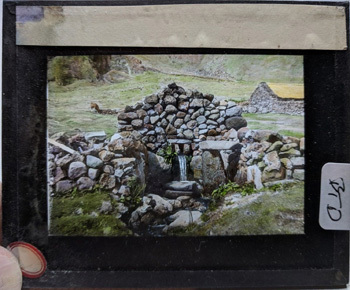 The glass slides are 4 inches x 3.25 inches (10.16cm x 8.25cm), and appear to be in good condition, apart from a few with mostly minor degradation. Two images are duplicated. Most are original photographs, but several are halftone images copied from printed sources, and others have appeared in later publications. The provenance of the slides is not stated, but the printed labels name companies in Paris, New York and Chicago, and the vendor in based in the US. From the subject matter, it seems that they were produced for lectures by the Society for the Propagation of the Gospel in Foreign Parts (SPG). Three photos were copied from the book "The Lonely Island" by Rose Rogers, whose husband Rev. Martin Rogers was the priest on the island from 1922 to 1925. The original photographs in the collection seem to have been taken during the visits of three or possibly four ships. The RMSP Orca (Capt. Le Brecht) dropped a raft with supplies and mail off Tristan in 1926, but did not establish contact with the islanders. Unfortunately, the raft was carried the wrong way by the current and lost. Capt. Le Brecht tried again in 1927 on the RMSP Asturias. This time, the supply raft was intercepted successfully, and he entertained 30 islanders on board ship. The Rev. R.A.C. Pooley and his lay assistant Philip Lindsay arrived later that year on the SS Suveric. They appear prominently on the photographs taken in 1928 during the visit of the cruise ship RMS Empress of France (Capt. Griffiths), which brought supplies to Tristan. Pooley was not a well man, and when the RMS Duchess of Atholl brought 25 tons of stores in 1929 (again Capt. Griffiths), he was relieved by the Rev. A.G. Partridge. Lindsay, however, stayed on for a further year, leaving on the SS Tymeric in 1930. Many of the slides feature St. Mary's Church and its clergy, with three showing the interior of the church during its refurbishment. 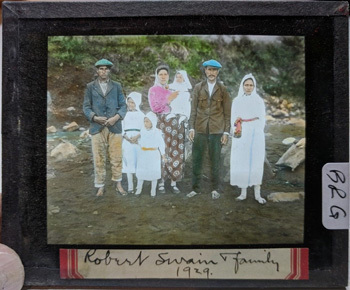 There are several interesting pictures of families, including Lavarellos, Swains and Glasses, as well as other groups of islanders, mostly taken on the beach while landing supplies. There are some photos of cottages, and more general views. Several pictures are taken on board ships, with shots showing supply rafts being built and launched, and islanders visiting the Duchess of Atholl, including women. 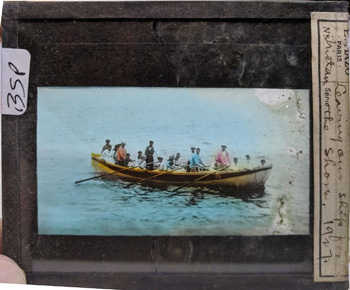 Lastly there are odd slides of graves, longboat building, water supply, visiting doctors, etc. All but three of the slides are labelled with three-letter codes in a discrete block. They tend to group certain topics together when sorted alphabetically, although there is no obvious flow of subjects. In the list below, the slides without codes have been inserted in the most appropriate gaps and identified with an asterisk. The list below gives: the slide code letters, the vendor's lot titles, and the captions written on the slides, plus my notes. Zoomable images of all the slides are available on your local version of eBay. To find a slide, search for "lantern" and the slide code letters (e.g. "BRH"), or keywords from the lot titles - e.g. "lantern BSZ" or "lantern Repetto". Please note that the vendor's lot titles contain a few errors. Rev. Partridge and the mongoose. 1929. 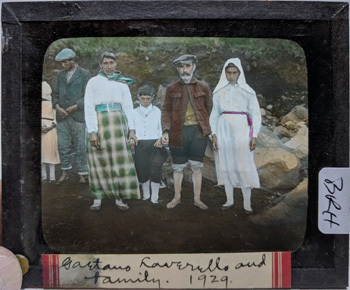 Gaetano Lavarello and family. 1929. Tristan: Dr. Vandenhaaf(? ), Owen. C. Wilkinson, Dr. William Kline, H.G.M. R.F.Glass. BRP - TRISTAIN DA CUNHA all the children !! Tom Cotton's grave on Tristan. Robert F. Glass and family. Mrs. Gaetano Lavarello and daughter [Mary 'Jane' and Margaret Kathleen]. Women at the door of one of the cottages: 1928. Some of the children who stayed at home. Mr. Lindsey and Martin De Wirth[?] at Lindsey's cottage. 1928. BSE - TRISTAIN DA CUNHA HENRY HOME WITH FLAG! Henry Green's house: Flag awarded by England for life saving. 1929. Church of St Mary: 1929. One of the Cottages: 1928. A Tristan fire place. 1929. Tristan islander and his home: 1929. Inside of the church of St Mary. 1928. Interior of the Church 1929. The raft off at Tristan Island. 1926. BSP - TRISTAIN DA CUNHA SHIP TO SHORE 1927 WOW! Leaving our ship for the shore. 1927. Swinging out the raft for Tristan: 1926. Boat building on Tristan Island.